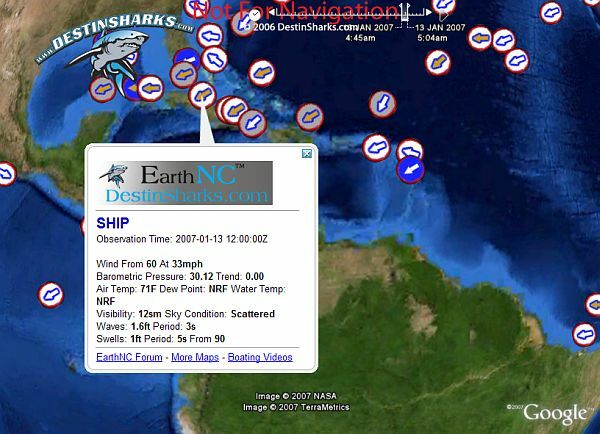 DestinSharks.com has become a real powerhouse in the realm of unique and powerful Google Earth application development. During the last couple of weeks he's been sharing with me his development of a nifty tool based on data from NOAA (National Oceanic & Atmospheric Administration). NOAA has encouraged commercial ships around the world to report weather conditions as they travel the seas. The program is called the Voluntary Observation Ship (VOS) Project. NOAA collects this data to supplement satellite and computer models with real-world surface conditions to improve weather reporting and predictions. DestinSharks could have just put up a network link with placemarks showing the weather data, but they went a bit further with it. If you download the VOS network link , you will immediately see circular icons with: arrows indicating wind direction, color indicating surface visibility, hovering your mouse over an icon shows basic weather data, and clicking on an icon shows you all the weather data. More importantly, the data is time stamped so you can drag the slider to see reports for each of the last 24 hours (some ships only report once a day, others report every hour). This is an excellent example of using the power of GE KML to portray a lot of information without flooding your eyes with too much information. See the blog entry for more details. By the way, the NOAA estuarine bathymetry data I wrote about yesterday, has already been added to DestinSharks huge marine charts project. And, if you join the beta test, you will see they now have about 500 marine charts available in Google Earth now!